About: The Worlds End is a pub that serves a variety of beers, wines and spirits as well as a selection of Continental dishes. They have Sky TV showing all the main sporting events as well as fruit and quiz machines and can cater for private parties. There is a nightclub situated in the basement called Underworld. The ticket hotline for the club is 0207 771 2000. "as unpretentious as they come"
Step into the World’s End and history awaits you, or something like that. The foundations of old markets are laid beneath it, the story of Old Mother Redcap is whispered from toilet cisterns and you can enjoy a drink in one of Dickens’ favourite haunts. So far so historical, but unfortunately most people that come here are in it for the quiz machines, the Underworld (live space directly below) and the enormity of it all, rather than taking a Time Team angle on things. The huge pub covers mezzanines, multiple bars, staircases and of course, the venue below it. Its inhabitants are a clash of the old and very young, the smart and the greebos, the leathers done up with Pantera patches and the suits of after workers looking to go grunge. It’s not the cleanest or most attractive place but it’s not hard to see the attraction here in a place that feels more like a neighbourhood than a pub. It’s pure rock and although it doesn’t wear the look in the way that say, the Intrepid Fox or the Cro-Bar do, everyone knows it and it’s as unpretentious as they come. There’s a little bit of food served from small catering hatches which put bluntly, looks disgusting (bar the tuna mayo on Mighty White) and the multiple bars dotted around serve up the usual brands of cider and beer. Prices are fair as are entrance fees to club nights and the alternative scene below. Definitely do come to the World’s End if you like the idea of recreating scenes out of Wayne’s World, but definitely do not bring a date with you, unless they get charmed by snakebite and pukey teens. Hello, I'm a Swiss guy and I was in London last week. I am looking desesperately for a french girl (she said she comes from Lyon) who is living in London. 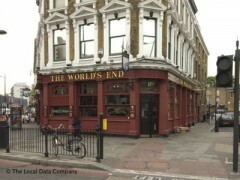 I meet her last saturday in the end of the world pub, in Camden Town. Her name is Audrey. I think she is 24 or 25 years old, has beautiful blus eyes (with a “beauty spot “ between the eyes) and an oriental tattoo on her earth. Do you know her? wo massive bars. As said its a popular meeting place but on a Saturday afternoon you'll spend most of your time wandering around looking for your mates in the crowd. Also be wary of the prices, Red Bull & Vodka is very expensive there. Still there's not a time I haven't wandered past it in my lunch hour and suddenly had the urge to go in for a pint! A popular meeting place as it's opposite Camden Tube, and large enough to accommodate many people on a busy day. It's location also means it has a refreshingly mixed clientel, but also means that some of the less-desirable of Camden's residents may pop in to try and nick your bag. Having said that, if you keep an eye on your stuff, it's a good, buzzing atmosphere in which to have a few beers, probably before going on somewhere else.